Michael Mulgrew thanked the Heavy Hearts of the Assembly for passing the most anti-teacher bill I've ever seen, and the folks at NYSUT hemmed and hawed, giving the impression they were not in line with Punchy Mike. But weeks later, the lovefest continues, and Magee and Pallotta are grateful to the heavy hearts. Why? Because we've put off the insane evaluation system for a year. In 2015-2016, teachers will likely be rated just as they were the previous year. This is, somehow, a victory. It's ironic, because I watched all the Revive candidates all over the state, and they condemned the current system as an abomination, heaping blame on then-President Richard Iannuzzi. They conveniently and consistently forgot that their biggest and most influential supporter, Punchy Mike Mulgrew, also took part in negotiating this system. As bad as this system is, the new one will certainly be worse. Cuomo has no qualms about what it's for. He wants to break the public school "monopoly" and he wants to fire more teachers. It's unconscionable that NYSUT leadership gives cover to weasels who call themselves Democrats and attack working people. And while it's better they go in for the kill later than sooner, it certainly doesn't merit our thanks. 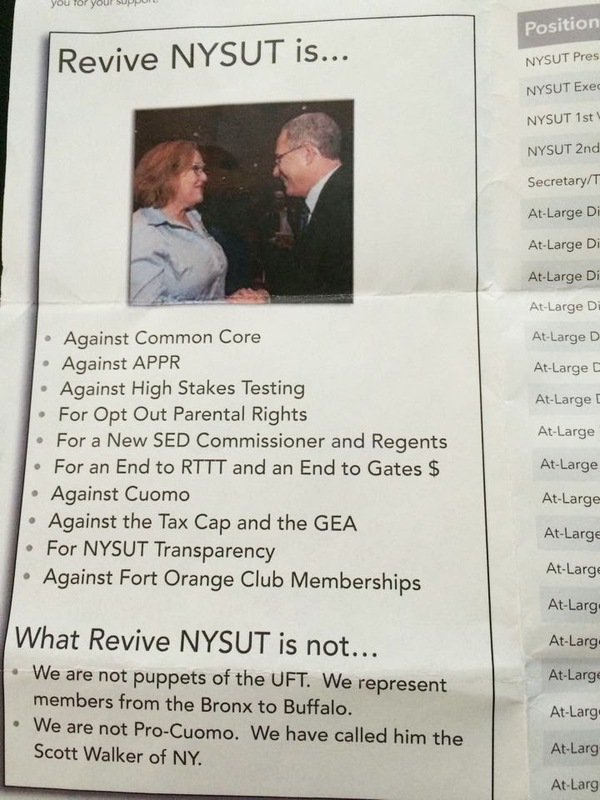 Remember, as it says in their campaign flyer above, Revive NYSUT was against APPR. That means, by my estimation, that they opposed it in its current form. Now, they have not only failed to do that, but they've endorsed a bill that worsens it simply because it does so later rather than now. This is just another in a series of "clarifications." Revive NYSUT was against Cuomo, but not when he was running in the Working Families Party primary. At no time did Revive make a move to support Zephyr Teachout, at that point the most dire threat to the re-election of our anti-union, anti-teacher anti-Working Families governor. And when Zephyr Teachout decided to oppose him in the Democratic Primary, at no time did Revive support her then either. In the general election Revive sat on their hands and did nothing. Only after he was elected did they react, shocked and stunned that Cuomo continued to be Cuomo. As for their alleged opposition to Common Core, at no time at the AFT convention did any of Revive's so-called leaders stand up to Punchy Mike's threats to push faces in the dirt if they laid hands on his Common Core. Magee basically suggested that it was Common Core or chaos, and there was no middle ground. Revive claims to favor NYSUT transparency, but their actions are so murky and contradictory that their words mean little or nothing. VAM is junk science, pure and simple. Dusting it off and dressing it up as a "growth model" is doubletalk, and if we accept it we are as stupid as they think we are. For the sake of the children we are supposed to teach, I hope that isn't true. Teachers are under attack. NYSUT and UFT need leadership. We're not getting it, and until we do we're going to continue to be handed barrels of garbage with big red bows wrapped around them. Leadership will continue to tell us to roll the barrels into our homes, ignore the stench, and hope for the best. If we don't demand better we're getting precisely what we deserve.